Caption slip reads: "Photographer: Brunk. Date: 1957-11-10. Reporter: Donoghue. Assignment: New Vic Theater Auditions Monday. 45: Dave Airey, British actor who played "Matthew" in this year's Pilgrimage Play, auditioning at Carmel Theater for New Vic Company. 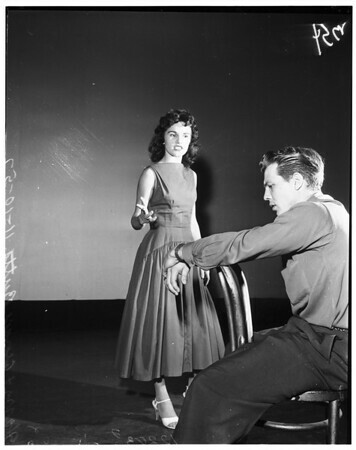 43 & 44: Bob Swofford, of Playa del Rey, and Pamela Roe, British student studying dramatics at USC, auditioning for New Vic Company, Richard Gray, producer, in foreground. 46: Forest McPherson (left), San Fernando, and Louis Cabello Junior, of Sun Valley, doing death scene from MacBeth at New Vic Company auditions. Candidates for audition [...] in foreground of [...] 49: Meg Brown and Frank Marsh, both Hollywood, run through lines from "Golden Boy" at New Vic auditions. 50: Group waiting for auditions being held by New Vic Company at Carmel Theater, West Hollywood. Gale White, Kansas City, candidate for auditioning, chats with Producer Richard Gray, in aisle. 53 & 54: Man and wife team audition for New Vic Company -- Harry and Georgie Butts of Culver City".